The ambitious 'Rhapsody' outing will kick off in Vancouver in July. On the heels of the success of the Queen biopic Bohemian Rhapsody, the current iteration of the band, Queen + Adam Lambert, have announced a 23-date North American arena and stadium tour for 2019. The outing, dubbed Rhapsody, runs from mid-July through late August. The six-week tour will debut a brand-new production, with Queen working again with the creative partners behind the News Of The World 2017 tour—Ric Lipson of Stufish Entertainment Architects on set design; Rob Sinclair on lighting design; and Sam Pattinson of Treatment Studio behind the video content. 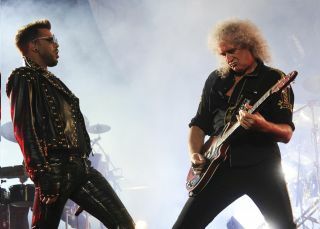 Added guitarist Brian May: “This is a great opportunity. Our last tour featured our most ambitious production ever, and got us our best notices ever. So we decided to rip it apart and get even more ambitious! Watch out, America!"